For the first time in program history the Columbia Women’s Swimming and Diving Team defeated their Ivy foes from Cambridge, MA in a dual meet. Harvard had the speed –setting five Percy Uris Natatorium pool records and winning nine events– but Columbia had the depth as they prevailed 163.5 to 136.5. Harvard freshman Elena Leiviska started things off with a win in the 3-meter dive. Columbia struck back in the 200 medley relay by finishing first and second. The winning team of freshmen Gabrielle Toback, Jennifer Shahar, and Trudiann Patrick, and sophomore Christina Ray went 1:42.15. Ashlee Korsberg, a freshman from Harvard, broke the first pool record with a 16:40.24 win in the 1650. The previous record of 16:44.25 was the oldest on the books and had held since 1982. Columbia’s Daniela Rueda touched second in 16:53. Harvard’s Victoria Chan wasted no time establishing herself as one of the top freshmen in the league with a resounding victory in the 200 free. Her 1:46.80 bested the pool record of 1:48.80 set by Columbia All-American Katie Meili in 2013, and was five seconds faster than second-place finisher Salena Huang of Columbia. Danielle Lee, a sophomore from Harvard, made it three pool records in a row when she won the 100 back in 54.54. She erased the previous mark of 55.53 set by Columbia senior Alena Kluge in 2013. 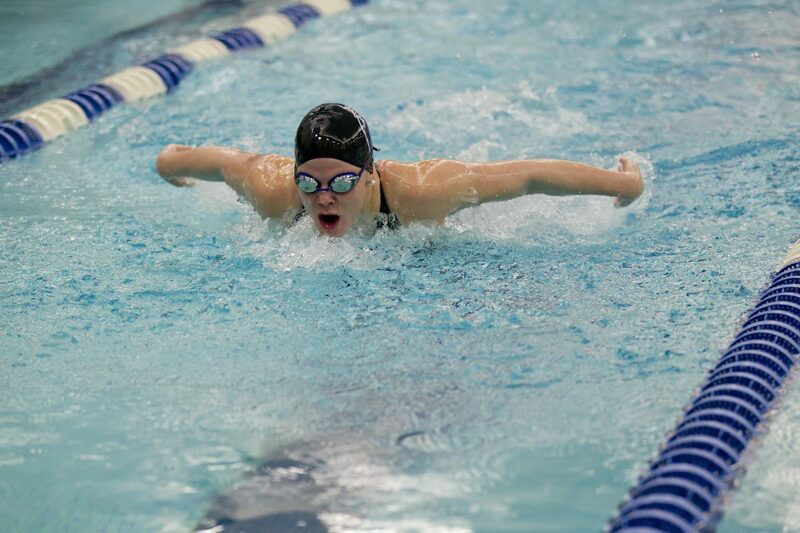 Columbia freshman Jennifer Shahar took the 100 breast with a 1:02.54 to 1:03.09 win over classmate Celia Frick. Columbia took the next event, too, as sophomore Kristine Ng bested freshman Patrick in the 200 fly, out-touching her 2:02.61 to 2:02.95. Harvard’s Chan and Leiviska each won their second event of the contest when the former took the 50 free (23.54) and the latter won 1-meter diving. Harvard senior Sarah Li and Columbia sophomore Lily Morris both touched in 52.05 to tie for first place in the 100 free. The Crimson’s Lee broke her second pool record, and Harvard’s fourth of the day, with a 1:58.88 victory in the 200 back. She came in just .11 under the 2013 mark set by current Columbia senior Kluge. Columbia picked up important points with a 1-2-3 sweep of the 200 breast, led by Frick’s 2:17.30. In the 500 free Harvard’s Korsberg made it two-for-two in the distance events, winning in 4:55.08. Columbia sophomore Mallory McKeon was second with 4:58.46. Columbia sophomore Ray went 55.12 to win the 100 fly, a second in front of teammate Patrick. Alena Kluge sealed the victory for the Lions by winning the 200 IM. Her 2:02.29 put her nearly a second out of reach of teammate Frick and almost three in front of Harvard’s Chan. In the last event of the day, The Crimson’s 400 free relay of Sara Li, junior Sarah Sumner, freshman Daniela Johnson and Danielle Lee broke the pool record with their first-place finish of 3:27.25. The previous mark of 3:27.37 had held since 2011. Columbia’s next match-up takes place Friday, November 15 when the Lions host Yale at home. Harvard travels north to Hanover, NH to confront Ivy rivals Dartmouth and Cornell on Saturday, November 16. You person are the joke. USC was suited for their dual meet against Arizona and seeing as how USC would trounce Harvard anytime anywhere, your comment about suiting for dual meets is dumb. Also saying that Columbia’s times were poor is also incorrect given that in the 100 Back and the 100 Breast alone, the times that Columbia went are comparable to the times that USC, again far superior team to Harvard, swam. Please keep your bitter opinions to yourself, especially when they are incorrect. ^^ ??? What poor sportsmanship.